Paprika 3 supports adding multiple large images to a recipe. To add photos to a recipe, edit the recipe and click the photos tab/section, then click the + button. After saving your edits, you can tap/click the thumbnail in the recipe view to open a photo gallery with all the added photos. 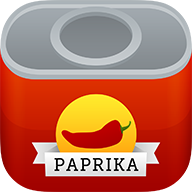 Photos will sync via Paprika Cloud Sync but will only be downloaded on demand (for instance, when opening a recipe). Description, ingredients, directions, notes and nutrition text fields can also have images embedded in them using a special Markdown-like syntax. Use the recipe editing toolbar below (iOS/Android) or above (Windows/Mac) the text field to assist you in inserting the text to link to images.